Any small business owner knows that picking the right location - possibly in a busy mall or highly-trafficked downtown corner -- results in more customer visits and opportunities to make sales. The same rule has also proven to hold true for the Web. The rush for online real estate back in 2000 was similar to the Texas Gold Rush for domain names and created a totally new industry of "squatters". These squatters continue today to make hundreds of thousands, if not millions on the sales of "dot-com" names they've bought up cheaply and held on to waiting for the right buyer. Now, with the advent of social media, businesses big and small are rushing to claim their spot within an array of new Web 2.0 sites that are attracting millions of people daily. What's clear, is that social media sites are here to stay and just like the days of the "dot-com" Gold Rush, valuable domains within them are becoming a hot commodity. Please don't be fooled -- these social media sites aren't just for teenagers. Small mom and pop shops to Fortune 500 companies are getting involved right now. Social media is so popular that you can hardly do a search anymore without noticing at least a couple of social media sites within the top 10 listings. 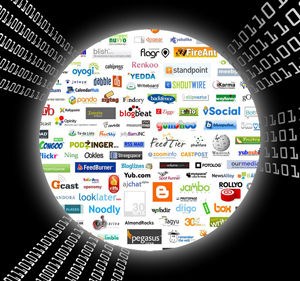 These sites include everything from Twitter to MySpace and YouTube and a whole bunch more. Pretty cool huh? Well at least we think so. To help you get started and claim a spot for your business, I've compiled a list of some of the top social sites. You need to be securing the proper URLs and usernames for your business on as many of these sites as you can, and you need to do it soon. Del.icio.us: I still haven't figured out the name, but for whatever reason it works. Del.icio.us allows you to organize and publicize interesting items through tagging and networking. Digg: Digg has an almost cult-like following and continues to be one of the top-trafficked sites on the Web. Visitors can submit and browse articles in categories like technology, business, entertainment, lifestyle and more. If you like an article, Digg it! Furl: Furl is a place to bookmark great sites, including your own, and share them with other users by recommending links, and commenting on articles. Gather: Browse categories concerning books, health, money, news and more to ignite discussions. The network community will help your company tap into its target audience and find out exactly what they want. Ma.gnolia: Similar to Furl. Share your favorite sites with friends by using their cool little bookmarks. Everyone will be impressed by both your Internet savvy and your heightened organizational skills. Newsvine: Upload articles related to your company or services, studies or other news-related items to this site. A free account will also get you your own column and access to the Newsvine community. Ning: If you ever feel inspired to create your own social network, where you can bring together clients, vendors, customers and co-workers in a secure corner of the Web, go to Ning and design a free social network to share with anyone. Reddit: Here you can upload your articles to drive traffic to your site or blog. You will benefit from submitting items often as you'll gain a more loyal following and increase your presence on the site. StumbleUpon: Bring some StumbleUpon into your life by adding their toolbar to your browser and surfing the Web. This will help you connect with friends and meet people from all over with similar interests. Squidoo: Share your "expert" knowledge on Squidoo, where people go to pick up on industry secrets in a Q&A forum. Achieve bonus points for being witty. Technorati: A great place to show off your blog and increase your readership. Technorati is a network of writers and blogs listing top stories in categories like business, entertainment and technology. Tubearoo: A YouTube for businesses. Tubearoo allows business owners to create and upload video tutorials, commentaries and interviews to promote their own services. Twitter: Communicate and stay connected with friends, family, and co–workers through the exchange of quick, frequent answers to one simple question: What are you doing? Don't feel pressured to answer that question. WikiHow: Know something? Create a how-to guide or tutorial on WikiHow to let everyone know how smart you are. Oh ... and you can also use it to share your company's services with the public for free. Bonus. Wetpaint: Create your own wiki to reach and increase your company's presence online. Easily organize articles, contact information, photos and other information to promote your business. Wikipedia: Have you heard of this one? Besides creating your own business reference page, you can connect with other fellow users on Wikipedia's Community Portal where scrupulous professionals enthusiastic about business, news, research and more hang out to chat. Yahoo! Answers: First step, create an avatar. Next, start fielding users' questions within this social media Q&A forum. Search for questions in your areas of expertise such as small business, finance, legal, news & events and more. If you continue to dish out practical advice and link back to your company's website, you'll quickly gain a new following of customers. Okay, so my point is don't wait until it's too late to claim your spot. Set aside an hour or two and register your company name with these top social media sites before someone else has registered your same business name and you have no control over what they are saying or doing with "your" space. Just like there are domain squatters there are also squatters for the best profile names on the most popular social media sites. You need to be the one who adds the content to these pages, completes the profiles and gets them ranking for those phrases critical to your reputation. It gives you another shot at reaching customers who don't happen to click directly through to your site. And at the very least, it's about reputation management. What you do with your space from there largely depends on your Web craftiness and expendable hours you have to fritter away in your busy workweek. With a little bit of effort and upkeep, you should be able to create a member profile that directs traffic back to your company's own website.